A very interesting case. What would happen if the laptop was a Chromebook and all his information was in the cloud on a server, say in China. Do the immigration officers have the right to view his data then? The data in that case would be accessible within the country anyway. What if the laptop doesn’t have a password and uses face recognition technology (as many now do)? 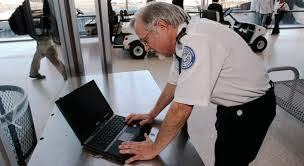 Can the officers force him to authenticate the login? Can you disagree and asked to be sent back to wherever you came from, and if so who pays for your trouble and expenses? I can completely understand the need for interrogation in certain cases, but it should be kept to a minimum and could it not be done before someone boards a flight, rather than when they are in a different country? I don’t imagine that if you refuse to come in they will just let you go, it could be a sign of guilt after all, and the authorities do say that they keep these things to a minimum although what that actually means is unclear. As for the cloud question yes, they can search your cloud data. The cloud is no more personal and certainly no safer than any other form of storage. In the spate of ransom trojans that have recently taken over computers they have also taken possession of data held in the so called cloud. It is just on a bigger hard drive linked to your computer after all. As for the facial recognition question I am sure that the US government can get past any security systems that your computer contains, and I think recent history shows that. Security does not exist, the whole idea is just to make you feel better, not reality. Anyway can’t you do it just using a photo? Great response. So the moral of the story is store important stuff in an overseas cloud, but don’t integrate it with your laptop/tablet, just login using your web browser. That should keep you a little safer! The thing is, if the cloud is in another territory, should they not ask that territory’s permission? After all, they are in control of those data servers and could manipulate or remove it. Logistically and cost wise it would be very difficult for border control to search more than a tiny number of hard disks. Regardless, it would be very disturbing if it happened to you. In Australia they can certainly check your media if they suspect that you have illegal (censorship wise) movies.